You can harvest sunflower seeds in the fall after the petals fall off and the back of the flower head turns yellow or brown. Where I live, in southern Ontario, this is usually in late September to mid-October. If you don’t cut down the dried out plants, birds will eat the seeds. Personally, I tend to leave them up as natural bird feeders. A few stray seeds always land on the ground and these become next year’s sunflower plants. If you want to harvest sunflower seeds and save them, cut the flower head off after it has turned yellow or brown. Then store it in a dry, well-ventilated place to allow seeds to dry for several weeks. Once the head has dried, just rub your hand over it and the seeds should fall out easily. If you want to replant saved seeds next spring, store them in a paper envelope in a cool, dry place. Avoid airtight containers like jars because mold can develop. Your seeds are likely to be open-pollinated, and so next year’s plants aren’t guaranteed to be identical to this season’s. 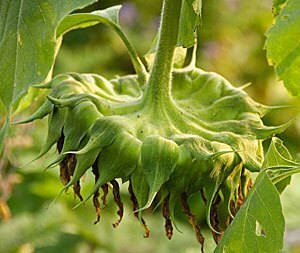 One big sunflower head can yield a lot of seeds, so you can keep the rest for roasting or for feeding birds over the winter. To roast sunflower seeds, spread them in a layer on a baking sheet, and roast in a 350 degree F oven for 10-15 minutes. If you like your sunflower seeds salty, some sources suggest mixing a quarter of a cup table salt to a quart of water, and soaking the seeds overnight before roasting.